As expected, SW Florida median single family home sale prices rose in February, up 4.1% over last year’s numbers and up 3.39% from this January’s numbers. Sales volume was down 12% from last year and up 3.17% from this January. These sales numbers were not unexpected as we’ve definitely seen an uptick in 2nd home buyers from up North looking to secure their piece of paradise before prices go back up. Banks have also lowered inventory due to legal issues with the foreclosures which has dried up inventory at the lower end. Investors are finding it more difficult to find lower priced homes to flip. We’ve entered a period where the short term investor is being squeezed out and we’re left with long term investors who can purchase and rent the property with a positive cash flow, but can’t flip right now and make a guaranteed home run. Actually the market is healthier and more balanced in this period than it has been since 2005. It’s always dangerous to buy something with the immediate expectation of a flip. This is all well and good when it works, but too many speculators didn’t have a plan B if the market turned, which it obviously did. Back in 2005 prices a property wouldn’t cash flow, so when the flip didn’t work, neither did the rent for cash flow. Today investors truly should focus on long term. Prices are still well below replacement cost and artificially too low, so there is automatic built-in price increases on the way, it’s just a matter of time. Positive cash flow buys time, and a great investment provides cash flow and long term appreciation, not to mention possible tax benefits. For regular homeowners we always recommend buying a home that suits your needs and you can be happy in. Long term, a home is usually a good investment, but why suffer with a home that doesn’t meet your needs in the meantime? In the end the numbers work themselves out but you have to live with the home. You might rent a home you’re not crazy about, but why buy something you don’t like just because it appears to be a good investment? We’ve been hearing from banks and Fannie Mae that they could start releasing inventory again in the next month or two. We’ve seen listings trickle in, and we expect more in the coming months. The market has always had a thirst for more inventory, so that won’t be an issue. The lack thereof will create price increases, so the true test will be how much more bank owned inventory is on the way compared to market thirst. The answer is prices will rise; the question is how high and how fast. We’ll be keeping an eye out for the inventory as that will be the leading indicator for the answer to how high and how fast. One of two things will happen, and possibly both. Banks may start releasing more inventory in the coming months, and home prices could begin to rise as inventory levels drop off. We’ve been noticing a distinct pattern the past few months. Inventory levels have been dropping just as pending sales have been increasing. We can thank the banks for this as they’ve withheld inventory due to legal concerns over title and the foreclosure process. We’ve also seen an increase in closed short sales. 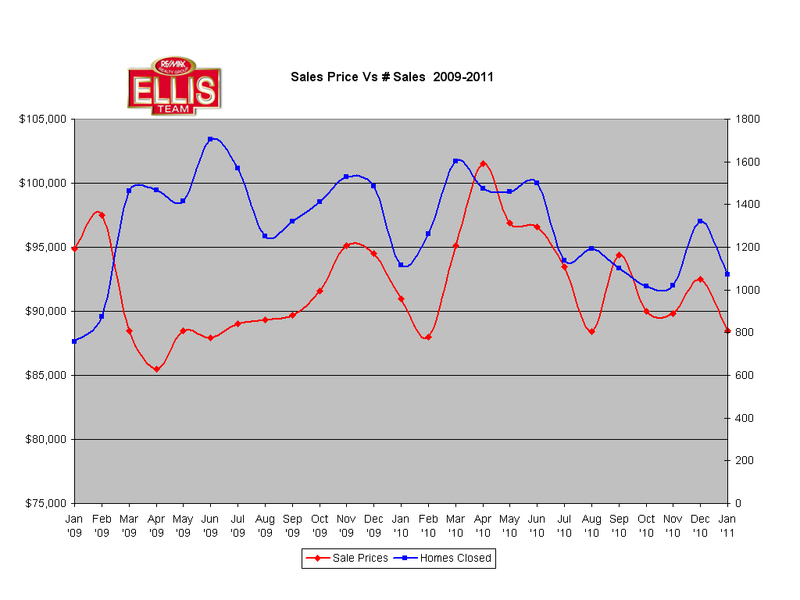 Lastly, we’ve seen a rise in regular sales, all leading to a decline in inventory levels. 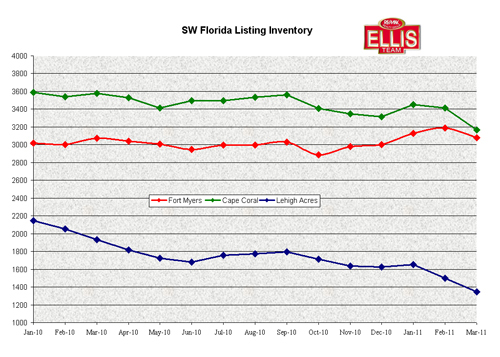 County-wide levels were down 4.32% from last month, and yet we’re seeing sharper declines like Cape Coral which had a 7.18% drop, or Lehigh Acres which experienced a 10.22% drop in available listings. Combine this with season and buyers from up North scooping up bargains and it would be easy to jump to the conclusion that home prices have to rise. In fact, we predict they already are. Last month’s numbers showed a drop in prices, but we’re not too concerned with that. Next week official numbers will be released and we believe they will be higher. Sales may be down from last year because the inventory isn’t there, but prices could very well be up. We wouldn’t be surprised to see prices gain close to 10% from last year’s numbers. If you read this article weekly, or our blog, you know that we’ve been predicting a decline in sales transactions combined with price increases at some point in the future. That point could be now. We would say definitively, however there are still some external wildcards that can influence transaction volume and prices in the short term. Those wildcards are banks releasing backlogged inventory once the title issues are worked out, and every indication is banks will start releasing again in the next month or so. The question is how much do they have left in SW Florida. We believe nationwide there is much left, however nobody knows about SW Florida as we’ve been in this crisis the better part of 4 years now. Possibly we’ll emerge as the rest of the country deepens, but something tells me we still have more to work through as well. Other wildcards include the US economy, oil, and Mideast stabilization as it pertains to energy. If the Mideast settles down and oil returns to normalcy, there are signs the US economy is headed for a modest recovery. Combine all this with the fact we believe we’re in about the 7th inning of the SW Florida foreclosure crisis, and we could be on our way to higher prices. We’re not predicting a return to 2005 prices, but rather a sustainable march to replacement cost prices. Once we reach replacement cost, builders will start building again, which will further fuel our local economy. Should the governor be successful in landing some companies to relocate to Florida, this could be a wildcard on the positive side. Bottom line is many factors are at play, but for the past year or so investors and Northern friends have realized Florida is on sale, and they’re buying. If we don’t see the negative wildcards, prices almost certainly have to rise. The reason we don’t believe they’ll double or triple anytime soon is because appraisals won’t support that, consumer spending may not support that, and we have hidden inventory that may enter the market. No, we’re not talking about the shadow inventory of banks, but rather shadow inventory of regular sellers who would sell if they could, but can’t because they’re currently upside down on their mortgage and do not want to suffer financial implications of a short sale. Once prices rise, we could see more sellers test the waters and attempt to sell. That’s a lot of variables influencing the market, and the most likely outcome we believe will be modestly rising prices, at a sustainable and healthy level. Once this becomes well known, more buyers will line up because they will have seen we’ve hit bottom and bounced back up. They will have missed the bottom, but this will be close enough to make them feel good and jump back in. We also believe banks will loosen credit standards this year. They’ve been too tight with the money looking for any reason not to lend, and this will change in 2011. Combine this with buyers realizing the bottom has passed, and we the conclusion we jump to is modestly rising prices. Let’s watch for the numbers next week. What conclusion do you reach? On April 17 rates are going up. How do we know the date? We know because that’s the date fees change under guidelines designed to attract private money into the lending system and reduce or eliminate FNMA, GNMA, and Freddie Mac, the three quasi-governmental agencies that insure mortgages and bundle them for securitization. They’re not really governmental, but they might as well be as the government has funded them until now. They are private companies that pay investors profit, but tax payer funded when they lose money, so something had to change. So what is changing? First off, rates are going up. This will increase yields, which will attract banks, hedge funds, and other large sources of capital into the market. Large companies will actually compete to make more of this money. A lot of money has been bottled up sitting on the sidelines and this may be the conduit to free up that money. 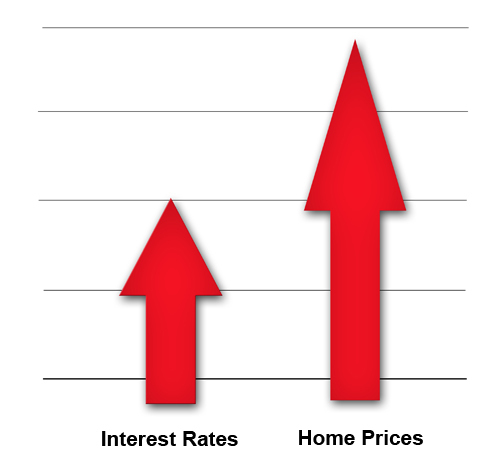 When rates go up, home prices usually go down. Not so fast! In this case, prices could eventually rise. Many ask how this could be. The answer is complicated, but noteworthy, so we’ll do our best to explain. Under the new guidelines to get the best priced loans, borrowers will have to put more down. The old 20% down will now be 30% down. However, credit scores will also be lowered for qualifying. Imagine many of those people that sold via short sale being told they wouldn’t qualify by FNMA for 5 years. It turns out they may be eligible after just 12 months under certain conditions. While rates may go from 4 7/8% today to possibly 6.5% in April, more people will qualify. We still have FHA for low down payment options. Some people are predicting another real estate boom coming sooner than later nationwide as pent-up demand for housing intensifies, and more borrowers being eligible to purchase. Imagine having a 540 credit score and being able to purchase a home. Those days may be coming again, if you can scrape together a down payment. Home prices are artificially too low in SW Florida and are in fact below replacement cost. This has caused multiple bidding situations for prestigious properties in short supply even in the upper price ranges in certain parts. Naples and Bonita have experienced a resurgence in prices, and many feel this is bleeding north up into Estero and Fort Myers. We are currently being driven by 2nd home buyers looking for deals. As prices get closer to replacement cost, building will begin to pickup, which will bring jobs. As the SW Florida economy grows, the real estate market could gain traction very quickly, especially with Snow Birds and existing residents qualifying sooner than expected for their next mortgage. Keep in mind 7,000-10,000 people are retiring or entering the social security income stream everyday. Florida stands to gain from the Baby Boom generation relocating or buying 2nd homes. Many on Wall Street are anxious to cash in on the looming change to the capital markets coming in April. In fact, Wall St is waiting like a tiger to pounce. Some are predicting a feeding frenzy for housing and rapid price gains. Some people believe the change to FNMA and Freddie Mac will damage the markets by increasing borrowing costs and raising down payment requirements. Others believe borrowing was next to impossible anyway the last few years and banks only lent to those who really didn’t need it. I don’t know who is right, but I will say if we open the door for more people to buy, the market could recover quicker than most expect. 2011 could really be a year to watch and keep an eye on the financing markets. If Wall Street gets greedy like last time, it could be a boom for real estate. The difference is, FNMA and Freddie Mac, and the US taxpayer won’t bail out bad loans, only systemic losses due to financial meltdowns. Hopefully we’ll enjoy the next boom with no meltdown, and higher down payments will help with that. If our markets stabilize like we think they will, even low down payments won’t affect the market because the market won’t be in freefall, and we’ll be adding jobs to the economy versus losing 8 million like we’ve done the past 3 years. Bottom line, keep an eye out for sunny days ahead in the real estate market and we just might see them sooner rather than later. And mark your calendars for April 17. This will be the beginning of something. Time will judge the ending. Posted in Cape Coral, Fort Myers, Fort Myers Real Estate, Southwest Florida Real Estate. A recent study by Core Logic reports that over half of the mortgages in SW Florida are underwater, meaning people owe more than the property is worth. WINK News interviewed Brett Ellis of the Ellis Team at RE/MAX Realty Group in Fort Myers about these properties in the Cape Coral and Fort Myers area. It seems on every appointment we go or every speaking presentation people want to know if our market has stabilized and finally headed up. The answer is it seems that way, but our market is still in the process of healing. The more complete answer is we are headed for better days; it’s just a question of where we are in the process. To illustrate where we are, we made a new chart that shows a timeline of median sales prices compared to sales volume, or # of transactions. Sometimes as prices go up or down it can affect transaction volume, so we thought we’d study that and show you. 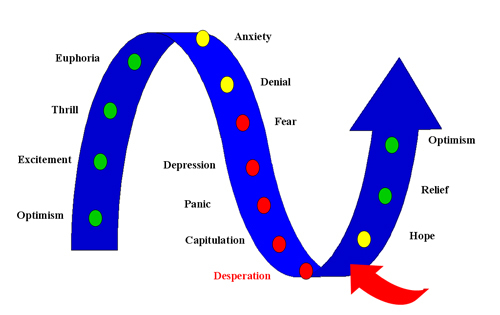 We’ve also included a graph of the Emotional Housing Cycle we brought to you in a State of the Market Report several years ago. When we first presented this concept we were illustrating that our market needed to go through a healing process and there would be pain ahead. Back in January 2006 when prices peaked we were in the Euphoria stage. We went on TV in October 2005 telling people this market had run its course and wasn’t going to sustain price increases and people had better start looking at the fundamentals of the market. We pulled investors from new opportunities. We bring all this up because back then it was a herd mentality, and we weren’t afraid to alert the market to a forthcoming change. People of course made fun of us and said this market was a run away train and we couldn’t stop it, as if we were trying to. Fast forward to 5 years later and you’ll find that we’ve gone through the painful process and we’re probably past Desperation and approaching Hope. I know if you’re home is in foreclosure or has been foreclosed and times are desperate, you might not be feeling the hope. From an overall market perspective, there is hope. A few weeks ago at the CCIM Outlook a question came from the crowd asking where we are in the foreclosure crisis. I answered I think we’re at about the 7th inning. We do see more foreclosures coming, but they are not at the pace and intensity we’ve seen in years past. Once we get to the point of fewer foreclosures, and fewer short sales, prices can increase rapidly. We’re not there yet. We’ll also keep an eye out for signs the overall economy is improving, and of course we always need to pay attention to wildcards like foreign oil supplies, interest rates, and financing availability. Fannie Mae and Freddie Mac may be privatized and lower down payment options may dwindle to FHA and VA loans. 2009 was a record year for sales. 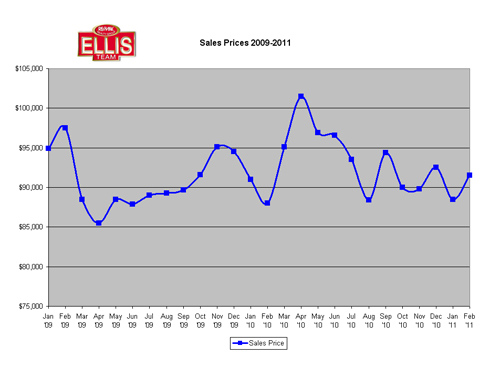 If you look at the graph, even though prices are down from last months numbers, transaction volume is higher than 2009. 2009 pumped out foreclosures at a record pace, so we probably will see less volume in 2011 simply because we’re seeing fewer foreclosures. Short sales are still a tricky proposition and not guaranteed to close in a timely fashion, if at all. Someday we’ll write a book on all the shenanigans we’ve seen banks play with short sales. We have sold several, we’re just saying don’t always count on banks to do the logical thing or what’s in the best interests of even the bank. We wouldn’t be surprised to see a rise in median prices next month and good sales volume as we are seeing a backlog in pending sales. We’ll be releasing our 2011 State of the Market Report soon which will cover some of these trends.